Icing is not the right consistency. A blow out in our piping bag. You drop an entire tray of completed cookies. You know...one of those days! Then....I got a couple of emails. I remembered WHY, I love decorating cookies. It is NOT the number of fans on Facebook. It is NOT the number of followers on my blog. It is NOT the the praise from fellow decorators. It is all about the CUSTOMERS! The mothers who purchase cookies for a 3rd birthday party. The devoted friend who hosts a baby shower and wants cookies to serve. Making people happy with my cookies makes me feel good. Making cookies that people appreciate, enjoy and order, that is what makes me happy. Are my cookies the most beautiful cookies out there? Do I sell as many cookies as others? But what I DO have is thankful customers. Today...I want to share with you the super simple cookies I made, and the emails I got in return. Super simple Onesie cookies for a baby shower, hosted by Kari. I just wanted to let you know how much all the guests and I loved the cookies you made for me in December! I had some left over and just finished the last one and let me tell you even after 3 weeks they were still as good, soft and fresh as day 1!! I can not get over how good your cookies were-- by far the best gourmet cookies I've ever had-- hands down!! Thank you so much again-- I hope I get an opportunity to Order your cookies again!! Next up, I did simple Curious George cookies for Courtney. Those two emails, they grounded me. They brought my head back to where it is meant to be. To simple cookies. Cookies that my loyal customers want. You are so absolutely right. We all have those weeks. I think I've been having that 'week' since Christmas! Thanks for putting into words the reason we do this. It is absolutely the smiles and happiness that a simple little cookie creates. BTW, those George cookies ARE fabulous! He's so cute! Thanks Lizy! It is the customers that matter, at least to me. When cookies become stressful..and no fun..it is time to think about that. Those smiles...that happiness...yep...that is what it is for! Thanks Cristin! Some days....it great friends like you that keep me going! Hugs! You are so right....tomorrow will be better and brighter. Thanks for the kind words! Melissa! You keep me going everyday! Thanks for always keeping me focused! Hugs! Thanks you Melissa! I think this post is something that I can look back on...when the days are hard and long! Love this post! I agree 100% with you. It's hard sometimes to remember what's most important. Thanks for the reminder! Thank you for the comment Carrie! I hope it encourages others as much as it does me! Melissa shared this post with a group of us and it really spoke to me. Oh Thank You Vtay! I am glad you enjoyed it! 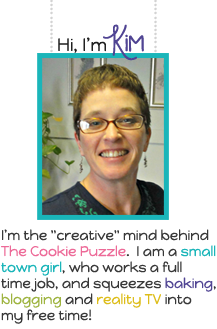 And welcome to The Cookie Puzzle...so happy you are here! There are always good days and bad days.....but you need to listen to your heart....you create something because it makes YOU happy...then to be able to share it with someone else is always great....sharing is good. I do know what you mean though...sometimes I think...gosh, one more knot is so boring...and then I have someone tell me how wonderful they feel when they sleep under one of my blankets...and I think, well, ok....I can do a few knots.....and what else would I do with my hands?? ?